Most of the DS cast members have achieved that unique form of pop culture immortality: They've been pictured on bubblegum cards. 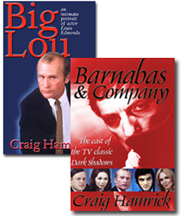 Two series of traditional-sized cards were manufactured while the show as on the air; two more have been issued in recent years. A set of newsprint pinups and some unique Quentin postcards have also been popular collectibles. Because so many of the cards and pinups were printed, all of the sets are pretty common and not extremely valuable. However, since relatively few people save the wrappers and boxes used to package gumcards, those items are worth considerably more than the cards. Following are examples of the various DS trading cards and pinups. The Red Series, manufactured by Philadelphia Gum Corp in 1968. The set consists of 66 cards with black-and-white stills from the TV show. 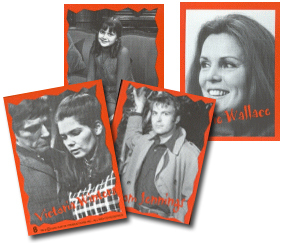 Almost half of the cards feature Jonathan Frid as Barnabas alone, but on other cards such fan favorites as Grayson Hall, Nancy Barrett, Joan Bennett, and Alexandra Moltke are pictured. Character "autographs" are printed on the cards as well. Below is the side of the box cards were shipped to the stores in. The Green Series, manufactured by Philadelphia Gum Corp in 1969. The set consists of 66 cards with black and white photos from the TV show. Almost all of the photos are from the story line set in 1897. One of my personal favorite characters, Grayson Hall's over-the-top Gypsy, Magda, is pictured on several cards. 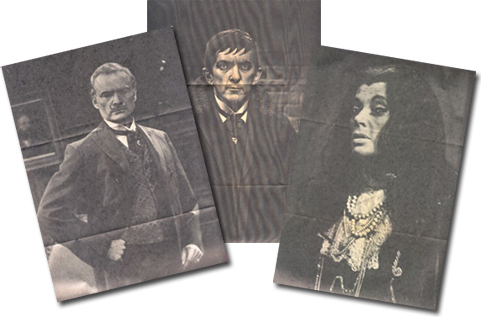 Philadelphia Chewing Gum Company manufactured a set of 16 Dark Shadows Pinups which feature portraits of the characters from the 1897 storyline, and they originally hit the market in 1969. The photos on the pinups are black and white with green borders. Two variations exist -- one set with the characters names printed on the picture in green ink, the other with the same signatures in white. The pinups in the two sets are otherwise the same, and there is no difference in value between them. Note: When I interviewed Sam Hall in 2001, he told me this pinup was Grayson's favorite DS collectible. In another interview, Lara Parker also singled her pinup as one of the collectibles she still had (in 1991). Also Louis Edmonds considered framing and hanging one of the pinups that featured him and some male costars on the Collinwood staircase, but he decided he had run out of wall space at the Rookery. And Nancy Barrett has one of hers in her personal DS scrapbook. I think it's interesting that these pretty simple items are among the stars' favorites for some reason. 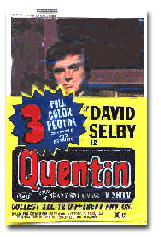 Quentin Postcards were also released by Philadelphia Gum in 1969. Each of the 12 cards features a photo of the dashing David Selby in character as Quentin. They were sold in packs of three for ten cents. Imagine Inc. card set: 63 cards featuring color photos from the show were released in 1993. Special sets were sold with randomly inserted autographed cards as well -- signed by Dan Curtis, David Selby, Kathryn Leigh Scott, Roger Davis, and Lara Parker. Celebrity Inc. card set: 66 cards featuring black and white photos were released in 2001. Six additional cards, with actors' names instead of character names, were also issued. 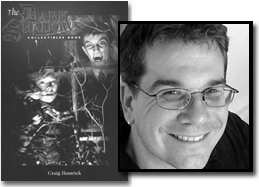 The contents of this Web site are copyrighted by Craig Hamrick © 2006.